This weekend, our Lock Apps reached the milestone of a combined TWO BILLION (2,000,000,000!) blocked app entries!. Thanks to these apps you’ll be able to protect your apps with a password from unwanted eyes. There are 28 free Lock Apps available. If you prefer to lock your apps from within one application, you can for just $0.99 with Application Lock Pro. 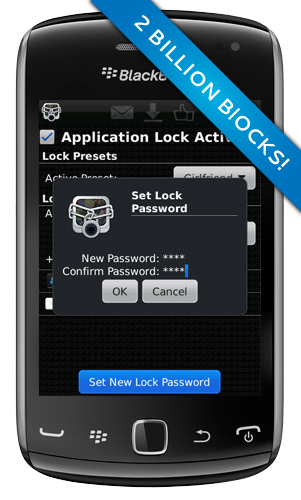 For an overview of all the free Lock Apps, click here. All Lock Apps are compatible with BlackBerry® OS7.